Without a doubt, one of the best books I’ve read this year. 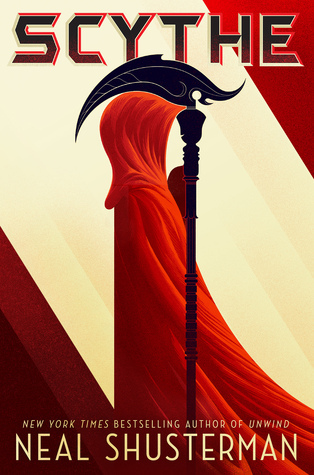 So glad that I was able to read Scythe before the end of the year and the release of the sequel. There’s still time for you to do the same! Pick up your copy before January 9th, and enjoy this fantastic read. Thank you Fantastic Duo for uploading the full version of the one performance from that show that I needed to see this year. Lately, I’ve been in love with Lee Eun Mi’s I Have a Lover for its emotional lyrics and for her incredible voice, and this collaboration came at the perfect time. Chen has grown to be one of my favorite vocalists over the years, and I loveee their duet (though, admittedly, the original is still better). It’s been about a year and a half since I watched YG’s WIN: Who is Next survival show for the first time, started to really care about a music group for the first time, and fell in love with Korean music. Now, YG’s back with another survival show, and instead of eleven people competing, it’s 170. Instead of keeping it all inside one entertainment company, YG visited over 70 entertainment agencies in Korea to hand-pick the contestants. So far, the show has been a lot of fun, and the stages have been overall better than those of other recent survival shows like Produce 101. My favorite of this last series was definitely the cover of DBSK’s Love in the Ice. MixNine’s also very well-subbed (thanks to MixNine Subcord and other dedicated fans). Be sure to check out the show if you’re interested in Korean music.